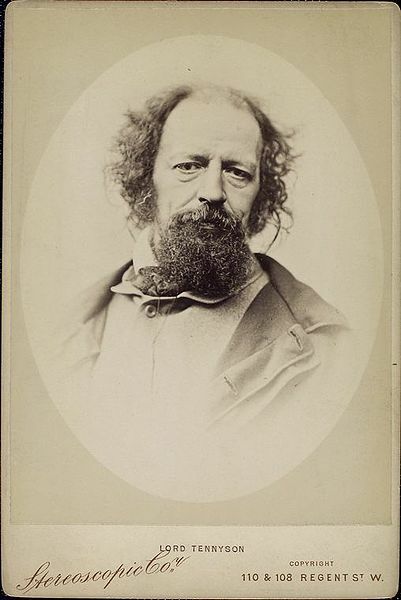 Alfred, Lord Tennyson is perhaps my all-time favorite poet, and while I much admire his wonderful Idylls of the King, I admit I am charmed by the earliest version that survived, “The Epic” which includes what would later become “The Passing of Arthur,” the final great poem, but also this beautiful prologue that associates Arthur with Christmas and describes a bit of Tennyson’s process and self-doubt, including an earlier version of Idylls of the King he destroyed. Because of “The Epic” I always associate King Arthur with Christmas. I will not post here the longer body of the poem that became “The Passing of Arthur,” but simply the opening and closing of the poem. “Why take the style of those heroic times? First, let me make it clear I am not advocating giving children the Starz’ Camelot series, which was terrible and not appropriate for children. What I am advocating is that you introduce a child to the Arthurian legend this holiday season. Last year for Christmas I got one of the best gifts ever – an iTunes version of the original Broadway Cast of Camelot–my favorite musical which I listen to almost daily–and it introduced me to iTunes, which has made my music listening better than ever–and my friend who bought it for me showed me how to use iTunes and soon I was discovering the videos as well and purchased the Merlin TV seasons and the HBO production of Camelot. For me, Christmas just doesn’t seem like Christmas without King Arthur. 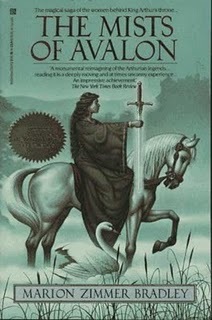 I remember Christmas 1992 when I received The Mists of Avalon, which soon became my favorite book. Another year I got the film version of the musical Camelot, another year Excalibur, and Bernard Cornwell’s novels, and many others. I am certain there will be something Arthurian for me under the Christmas tree this year. But never did King Arthur mean as much to me as when I was a boy and first read the fabulous stories as depicted in Sidney Lanier’s The Boy’s King Arthur. They captured my imagination in a way few other stories have, and they have stayed with me for decades now. In other words, in December we are to tell people of Camelot. Do you know someone who does not know the story and will appreciate, who will aspire to be a better person, to find more magic in life, as a result of discovering the tales of King Arthur? No matter what age, you can introduce Camelot to others. For children, gifts could include the film version of The Sword in the Stone or picture books about the Arthurian legend. For older children, how about the Prince Valiant comic books, the Merlin TV series DVDs, or early chapter books like Cheryl Carpinello’s wonderful Guinevere: On the Eve of Legend. For teenage readers, Mary Stewart’s Merlin Trilogy is a good introduction (I read them when I was fifteen). Don’t forget there are more than books and films, there are Arthurian products of all sorts out there. Maybe Mom would enjoy a King Arthur Flour cookbook. King Arthur video games can be found with little searching. Think about how you came to King Arthur. Did an adult first introduce you to Camelot with a coloring book, a storybook, a record…. 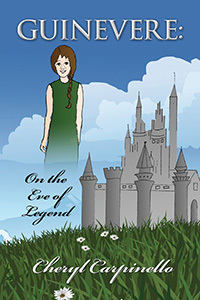 Keep the story of Camelot strong and inspired in the hearts of the next generation! Give the gift of Camelot to kids of all ages at Christmas! In December, 1974, when I was only three and a half years old, my dad took me for the first time to Marquette’s Delft Theatre to see my first movie. It was a terrible film—at three years old, I was already smart enough to ascertain that. I remembered very little of it over the years, but I would occasionally think about that terrible first movie I saw, which had the Devil chasing Santa Claus, moving the chimney on him so he couldn’t get inside houses to deliver toys, and sicking a dog on him. My dad also thought the movie terrible. For many years, I wondered what this film was named, and I looked in many video books for it, but only thanks to the Internet did I recently discover it was the 1959 Mexican film Santa Claus. And, I was even more surprised to discover it had an Arthurian legend connection—yes, Merlin and Santa Claus are buddies. I didn’t remember that part of the film when I was three—but I don’t think I knew who Merlin was yet, though of course, I knew Santa Claus. 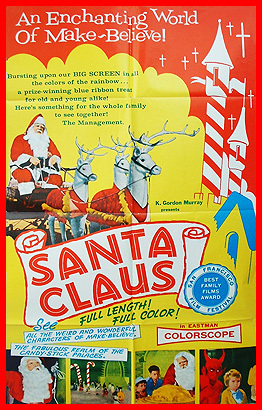 Santa Claus movie poster - with "weird and wonderful" characters - weird is right! So when I found this film on Amazon, I had to see it. Knowing it would be terrible, I opted to watch the Mystery Science Theater episode that featured it. I’m glad I did because I would have groaned through most of it, but the Mystery Science Theater’s cast made me laugh throughout. The story is simple and lame. Santa lives in a castle on a cloud above the North Pole. Instead of elves, he has children from around the world who help him. The beginning of the film shows Santa playing the organ as we are shown scenes of children from a slew of countries: Africa, Spain, China, England, Japan, the Orient, Russia, France, Germany, Italy, the Islands of the Caribbean, South America, Central America, USA, and Mexico—I know those aren’t all technically countries, but Santa and the Narrator don’t know that—yeah, there’s a narrator; sure sign the film is bad; he sounds like he’s detailing a documentary, like one of the old Disney wildlife films. Since we have to listen to children sing from each country, this part of the film really drags. It gets more interesting when Lucifer (the chief devil) tells the devil Pitch he must leave Hades and go to earth to make children evil and to destroy Santa Claus. Pitch isn’t a very convincing devil—he likes to dance about as if he thinks he can do ballet. He goes to Mexico where he whispers in children’s ears, trying to make them do things like steal a doll and later throw rocks at Santa. Santa, however, can see everything through his magical telescope, so he knows what Pitch is doing. Santa even has a machine so he can watch children’s dreams. He’s quite the Big Santa, and it’s only 1959! Soon it’s time for Santa to go to earth to deliver Christmas toys. Pitch is now out to stop Santa by moving the chimney so Santa can’t get in a house, as well as other, less effective ways to hurt Santa. Santa does get back at him in one scene by shooting at him with a toy cannon. Merlin, being a great wizard and capable of doing magical things, quickly solves the problem. Does he cast a fantastic spell to make Santa Claus suddenly appear back home? No. Does he turn the dog into a toad? No. Does he resurrect the Knights of the Round Table to ride to Santa’s rescue? No. No magical spells for Merlin in this film—other than the lame dreaming powder. Merlin yells back at Santa, telling him to reach into his bag of toys and pull out a toy cat on wheels, throw it down, and let the dog chase it. Once that works, Santa can climb down from the tree and escapes. Merlin tells Santa it’s time now for him to come home, but first, Santa delivers a doll to a poor little girl who has tried to be good. The film is overly sentimental and moralistic for our tastes today, but even in 1959, I don’t know how anyone could have considered it a good movie. The film certainly didn’t deserve its popularity. Why ever did the Delft Theatre decide to show this strange Satanic-Christmas concoction? According to Wikipedia, Santa Claus was quite a hit: “Santa Claus was considered to be a financial success over several holiday-season theatrical releases in the 1960s and 1970s. Broadcast of the film also became a holiday tradition at several U.S. television stations. The film garnered at least one award, winning the Golden Gate Award for Best International Family Film at the San Francisco International Film Festival in 1959.” And apparently, it was so popular it was worthy of being shown at the Delft Theatre in Marquette, Michigan when it was fifteen years old and I was three. I can only assume this popularity was due to a lack of children’s Christmas movies at that time, and that it was a time when we only got three channels on television, and we had no VCRs, much less Netflix to choose from. If we wanted to see a movie, we went to see whatever was playing. If you’ve seen this movie—especially if you saw it as a child like I did—I’d love to know your own thoughts about it.